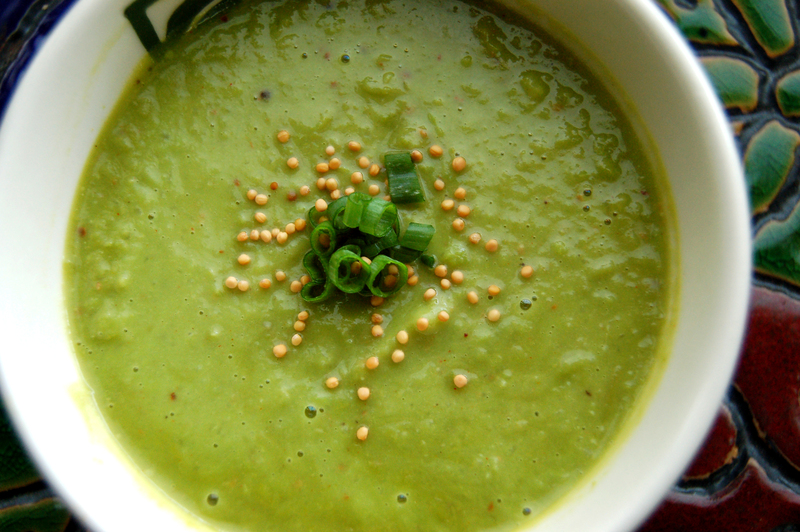 Nothing says summer like a bowl of pea soup! Okay, maybe there’s a lot of things that “say” summer, like grilling, pool parties, vacations… yea, soup normally isn’t high on the list. But this soup is so refreshing and can be served hot or cold! Low in calories and quick and easy. See – it’s perfect for summer! This recipe is also vegetarian and vegan-friendly. But you may use chicken stock or garnish with crumbled bacon if you are phobic about eating a meat-free meal. Have a bowl of ice water standing by. Bring medium saucepan of water to boil. Add peas and reduce heat. Cook for 3-4 minutes until softened but not over-cooked. While peas are cooking dice onion and mince garlic. Saute onion, garlic and fennel in coconut oil until translucent. Remove peas from boiling water and put into ice water to stop the cooking process (this is called “blanching”). This helps the peas keep their bright green color. Remove peas from ice bath and place in food processor. Roast Poblano pepper on the grill or on top rack of oven until nicely charred. After it cools a bit, remove skin with the backside of your knife. Remove seeds and stem. Add peas, onion, garlic, Poblano, coconut milk and curry paste to food processor or large blender (remember to remove spout cap if ingredients are hot to allow steam to escape or you will blow the lid off! I may speak from experience). Puree until smooth. Add additional coconut oil or milk, if too thick. Toast mustard seeds in a dry saute pan until golden brown. This takes less than a minute so be careful not to burn. Here is an optional step: Using a sieve, pour pea soup through (with a pan below) and work with a spoon until all has been strained. This will help eliminate any pea shells or chunks of onion or fennel that did not get processed thoroughly. If you like a little texture in your soup, just skip this step. But if you’re looking for silky smooth soup – go this extra mile (extra 15 min). Heat soup on low to medium until warm… or serve cold! Sprinkle with toasted mustard seeds and chives. 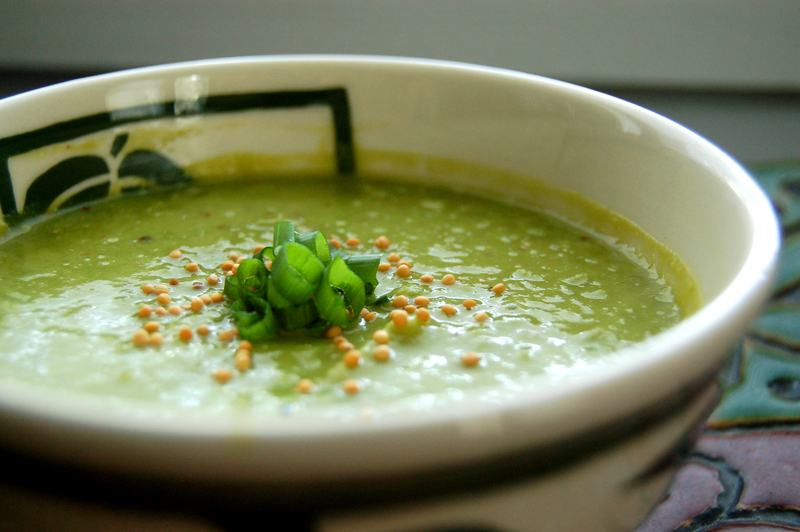 Of course the perfect bite of soup is a slurp… but make sure it includes some mustard seed and chive! Also, this is perfect with crostini drizzlde in olive oil. Try pairing it with an Austrian Grüner Veltliner. It’s a light, fresh, lively and delicate wine that will compliment this soup whether served warm or cold. When your mom told you to eat your peas, she knew what she was talking about. Peas flaunt twice the protein of most vegetables, so they’re the ideal substitute for fattier protein fare, providing an excellent strategy for controlling your fat intake. Read more about the heath wonders of peas here.